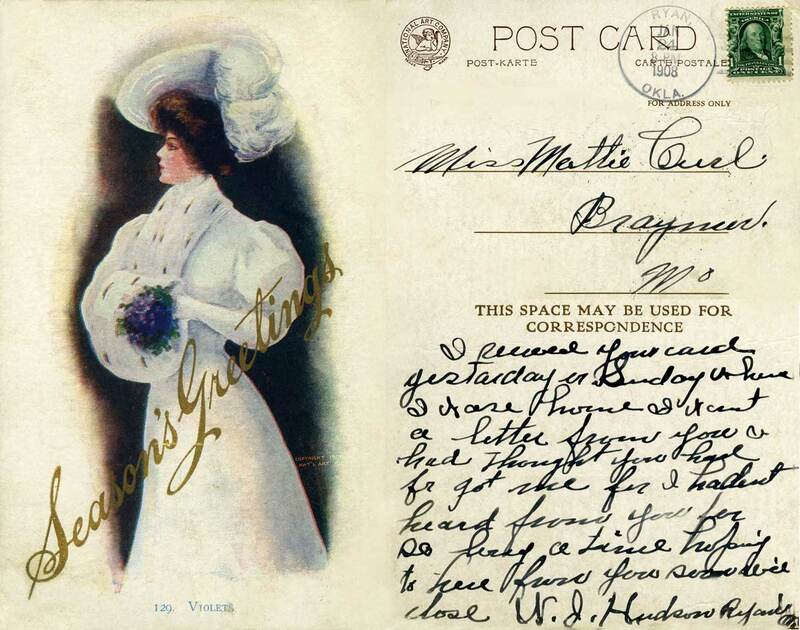 "Whitney Made Worcester Mass" with the simple message "To Alice from Harriet" and handed to her, most likely, for this card features neither stamp nor postmark on either side. Another "USA Made" card but without postmark or personal message. 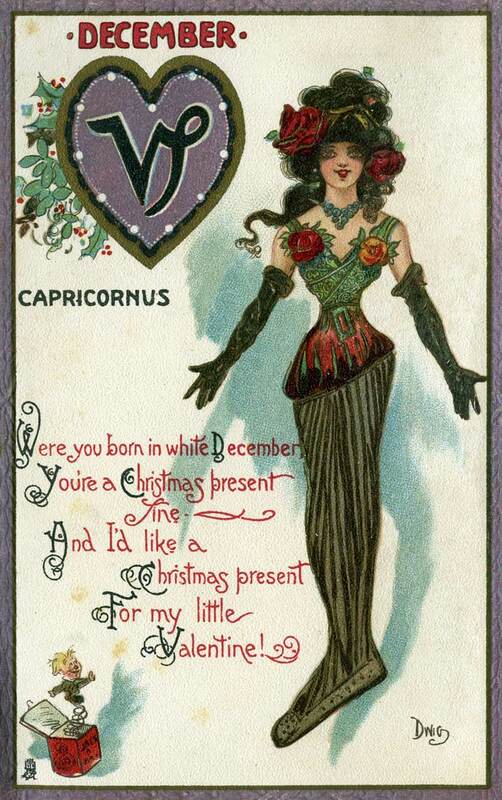 The featured message with the art may be contrasted with that on the card above it. 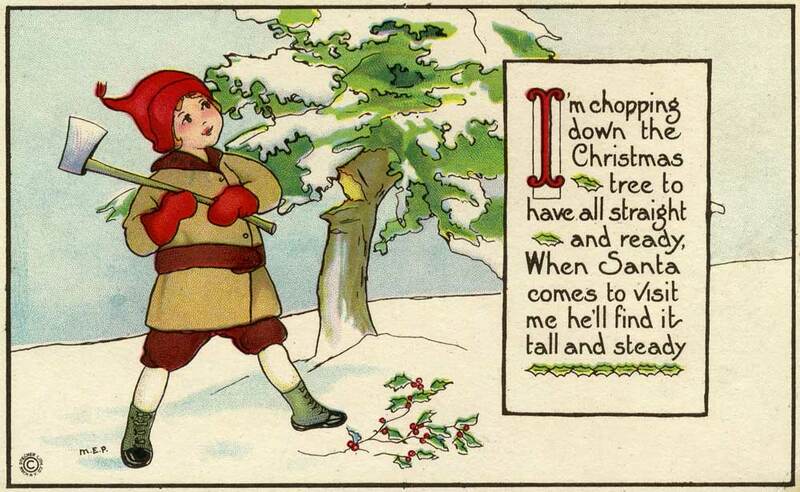 This is the one time each year when a child may be considered virtuous and not naughty for cutting down a tree. The card back for this art has fallen away, perhaps from heat. The message printed on the art side is a synergy of pagan, Christian and hour glass exposure. Clearly a "split message" card, and both sides of it are shown. 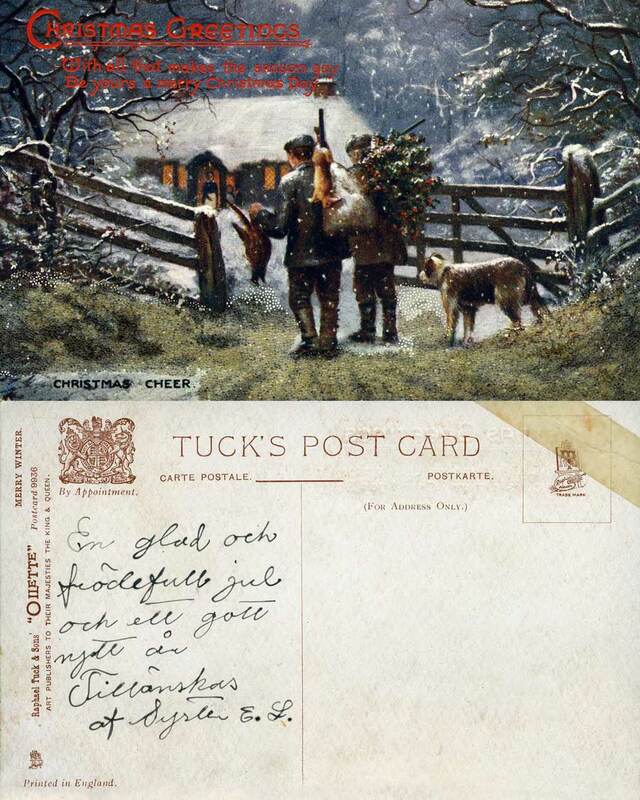 This is a Tuck's Post Card, a prolific English producer who yet printed this card in Saxony not Sussex. Tuck's cards also got their own titles. This one the company has named "Wonderful White Winter." Like this postcard many others end with a supplication that the person getting it write back more often. This one has a penny stamp but is not postmarked. Perhaps the author had second thoughts about sending it, or did not want to be separated from this wonderful winter. Meanwhile Nelda Yaeger in Tacoma may have been wondering "Why doesn't Mabel write me more often?" 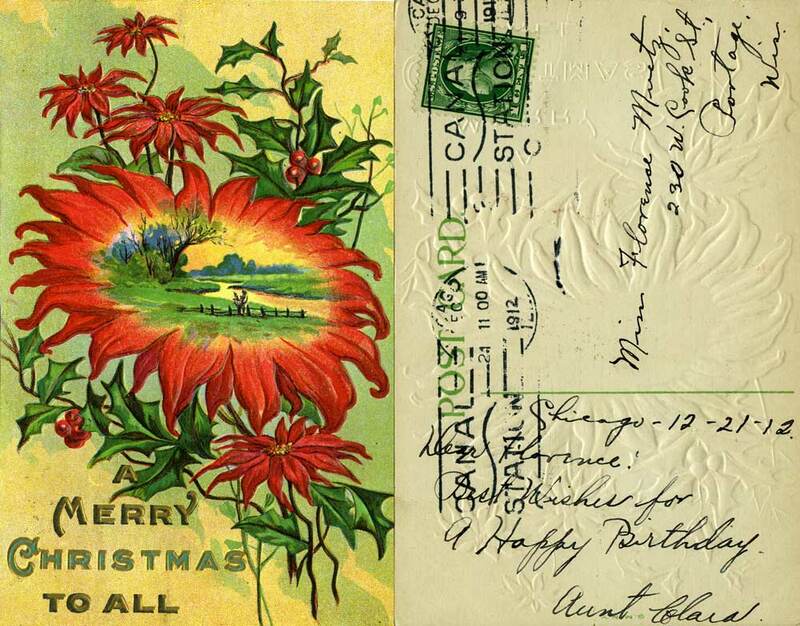 The postmarked date on his card out of Chicago is 1912. One can also feel this card, for much of its design is embossed. This lovely card was printed in Germany. The postmark is smudged but is most likely dated 1910. This card left Oklahoma for Missouri in 1908. We have taken the liberty to stack the text differently than its arrangement for publishing so that we could enlarge the art, which is titled "Violets." 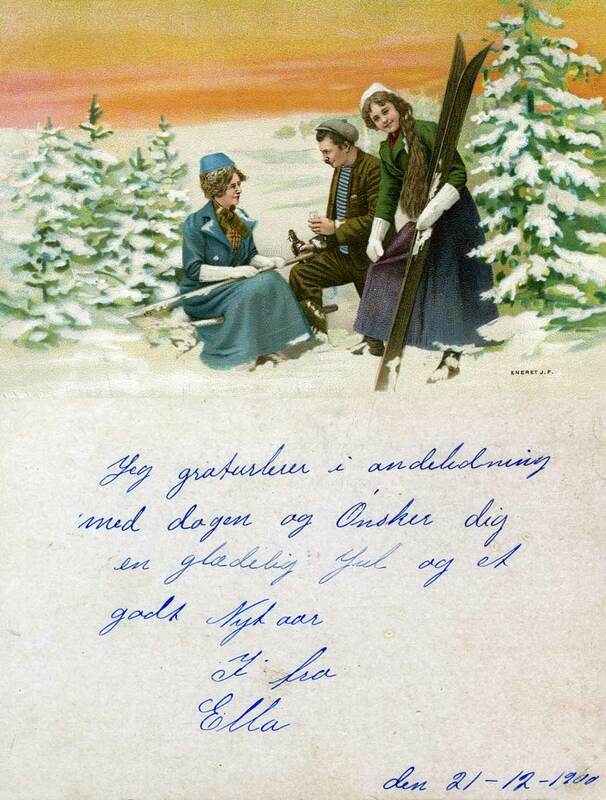 In this most fetching of cards the man in the middle is not fixing a ski but pouring some schnapps. Everyone is evidently happy that neither a ski nor a pole are broken. 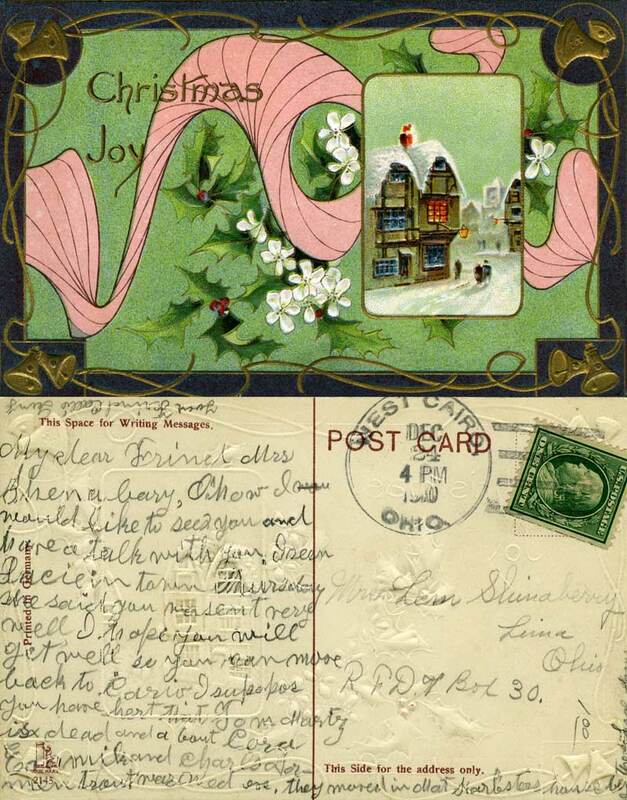 Dated by hand 1900 it was given by Ella without a postmark of any kind. "Printed in America" it is dated 1908, a year after such split cards were first allowed in the U.S.A. 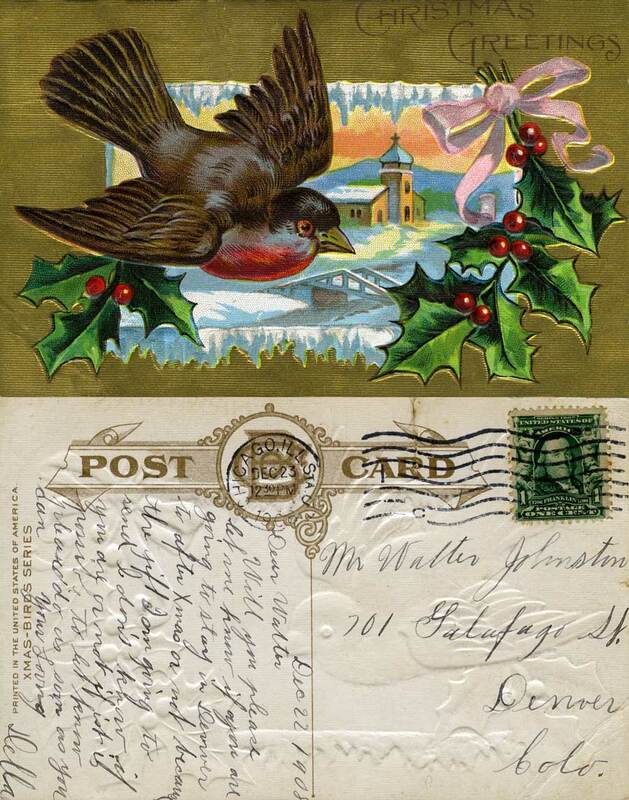 The publisher identifies this as one of its "Xmas-Birds Series." 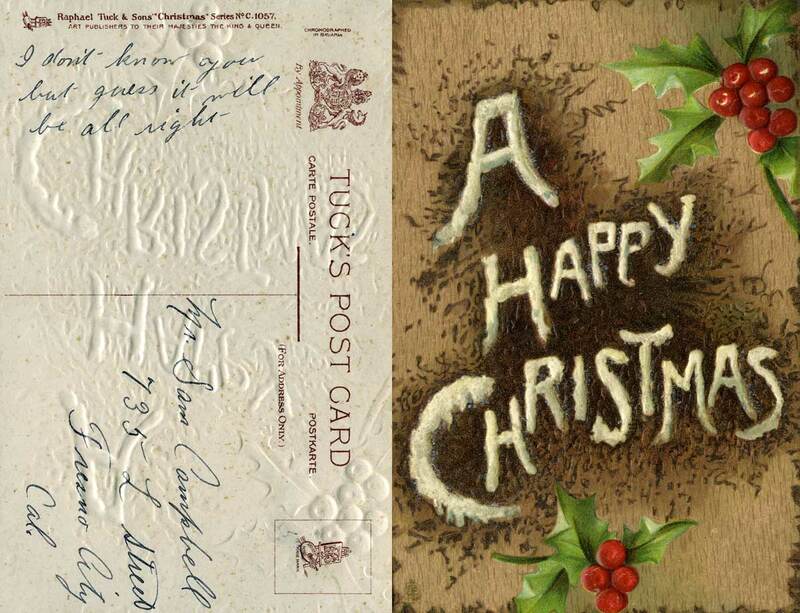 Another Tuck's card, this one, however, has been printed in England. It is numbered "Postcard 9936" and named "Oilette." What could be more cheery than waiting at the door and in the snow for one's man to return with a rabbit to skin and a pheasant to pluck? We have fidgeted with this and reduced the side with the art so that it could rest beside the message in one "frame." Sent from Czechoslovakia (perhaps Sudetenland) to Portland, Oregon, the text is in German, and the penmanship delightful. 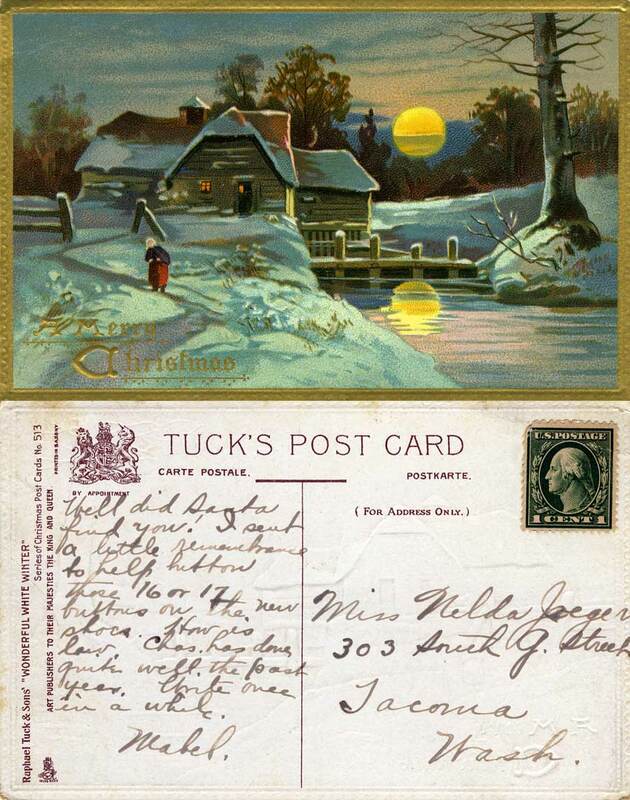 A textured & embossed card from Tuck's Post Card, again, ("art publishers to their majesty the King and Queen"), it was "chromographed in Bavaria." 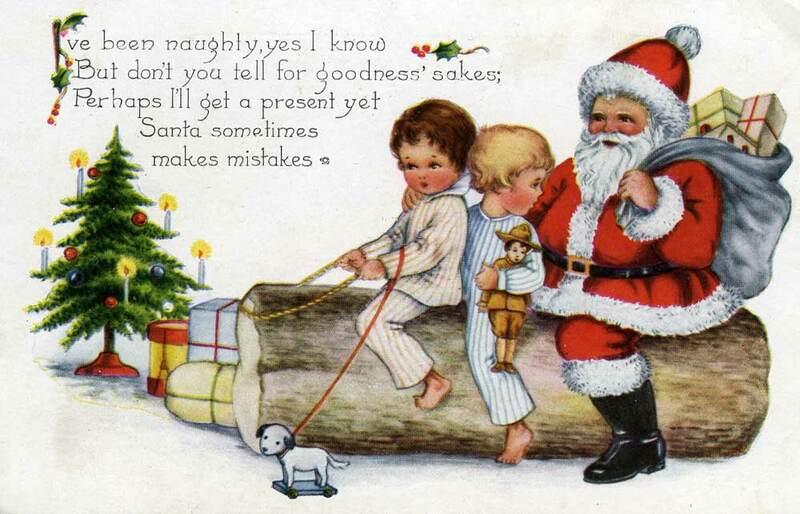 Here we conclude this exhibit of century-old cards repeating this last card's season's greeting. "I don't know you, but guess it will be all right." Those are awesome! I always enjoy your posts – thank you for taking so much time with them. We post to please – we post for you Jana.